This is the amazing view we saw sometime after 1:00 a.m. from the glass igloo before falling asleep on March 29, 2014! The experience of a lifetime!! 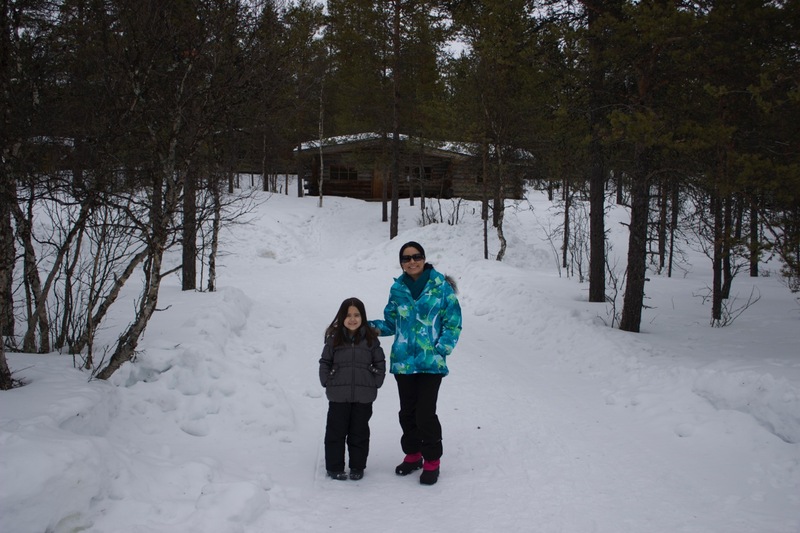 My family and I took the adventure of a lifetime this past weekend when we boarded a plane for a short one and a half hour trip up to Northern Lapland, Finland. 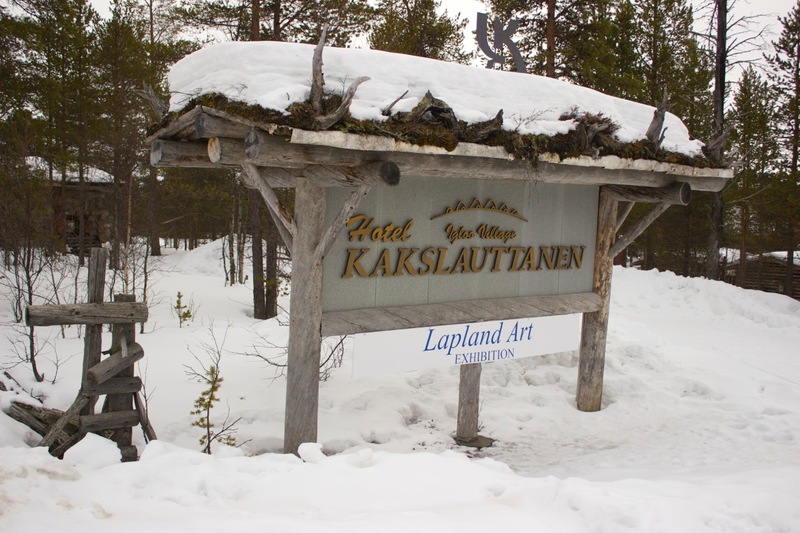 We stayed at the Kakslauttanen Arctic Resort in Saariselkä. 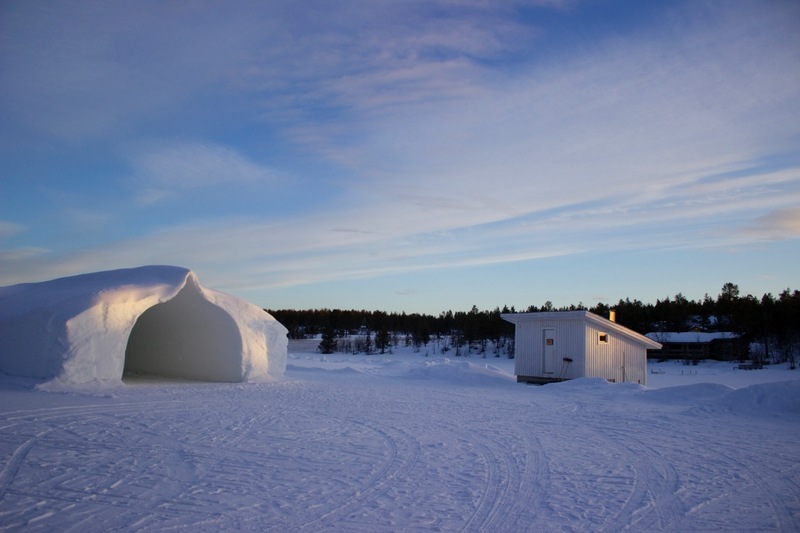 We decided to stay in one of the log cabins for the first two nights after reading some reviews and did the last night in the glass igloo (no shower, only a sink and toilet), but overall more spacious than we thought it would be. It ended up being one of the most exciting adventures of our lives! 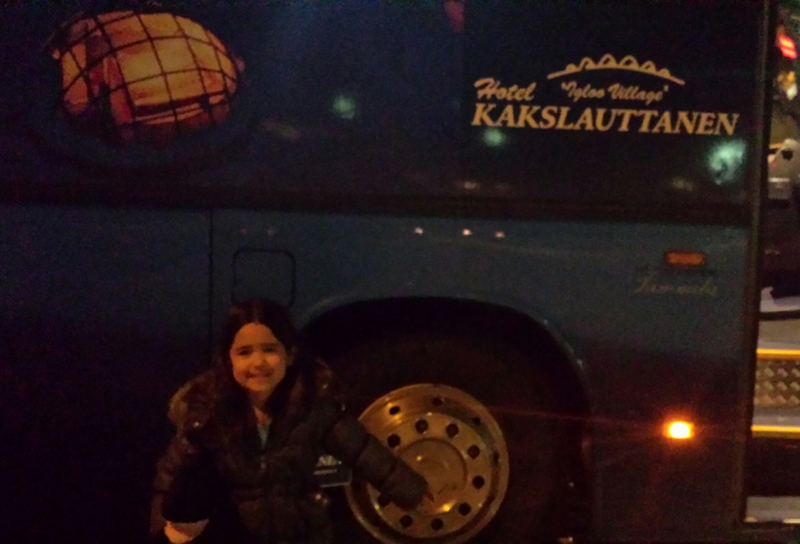 We flew into the very small Ivalo airport and were picked up by a transfer bus to the resort. We were then dropped off right in front of our cabin and given our key. It was very convenient and the staff was very friendly (the owner who claims to be Santa’s brother even gave Mia a stuffed reindeer). They served us and the rest of the small group on our bus dinner at the restaurant even though we didn’t arrive until sometime close to 11:00 p.m. Breakfast and dinner were included, but I would recommend asking for their á la carte menu for more local choices for the dinner. 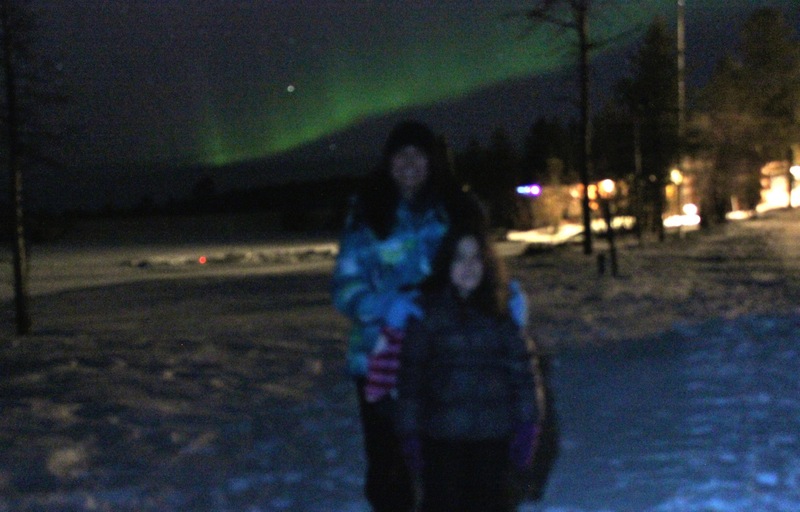 We were so determined to see an amazing show from the northern lights before we move in less than two months and we not only had one evening with an amazing show, we were completely shocked when we saw them 2 nights in a row (over one hour each night)!! The first evening was too cloudy, so we waited and waited the next evening and finally saw them sometime after 11:00 p.m. on Friday evening. One couple was so excited about seeing them that they got engaged right in front of us!! We gave up around midnight on Saturday evening after standing in the cold for so long, but then saw this amazing sight in the photo above sometime after 1:00 a.m.! We ran outside in the cold again and watched an even better show than the night before!! Everyone around us was so excited and I even had to email 4 different groups of people photos that we took to those who couldn’t take a clear enough shot from their cameras. It was a very exciting weekend for all of us at the resort!! This was right after we landed. Transfer bus to the glass igloos! We were so excited!! This was the cozy 2-bedroom cabin we stayed in the first two nights. It included a kitchen, living area, dining area, fireplace and also a sauna in the master bathroom. 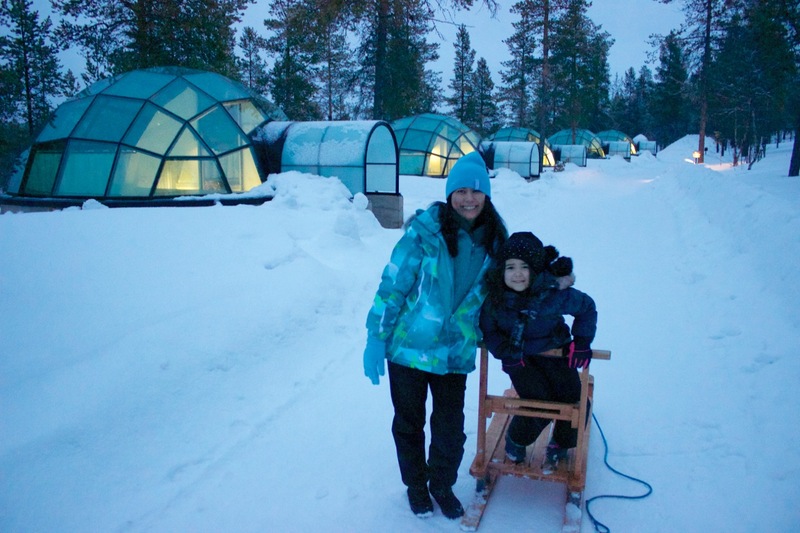 Mia and I in front of the glass igloos. There are only three rows of them (20 in total). A very special serene setting on a hill. 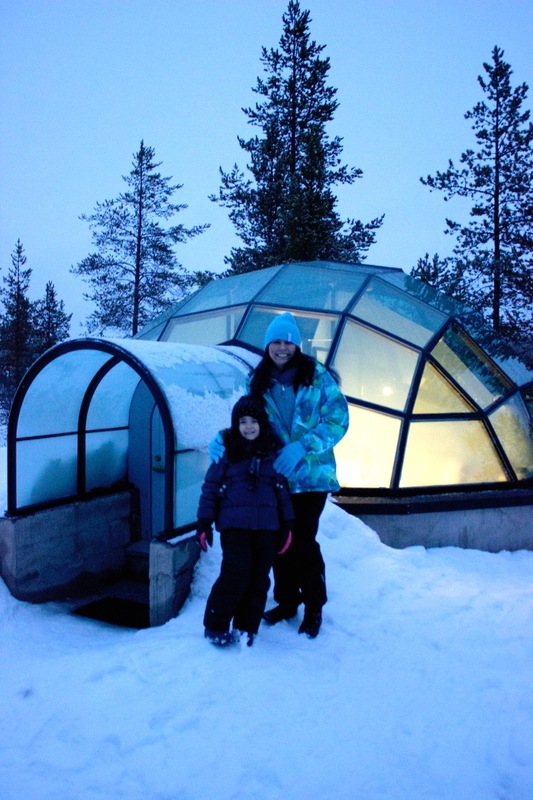 This is Mia and I in front of one of the beautiful glass igloos lit up before dark. Wow!!! The beautiful Northern Lights! Amazing things happen to those who wait… very patiently! The show of a lifetime!! 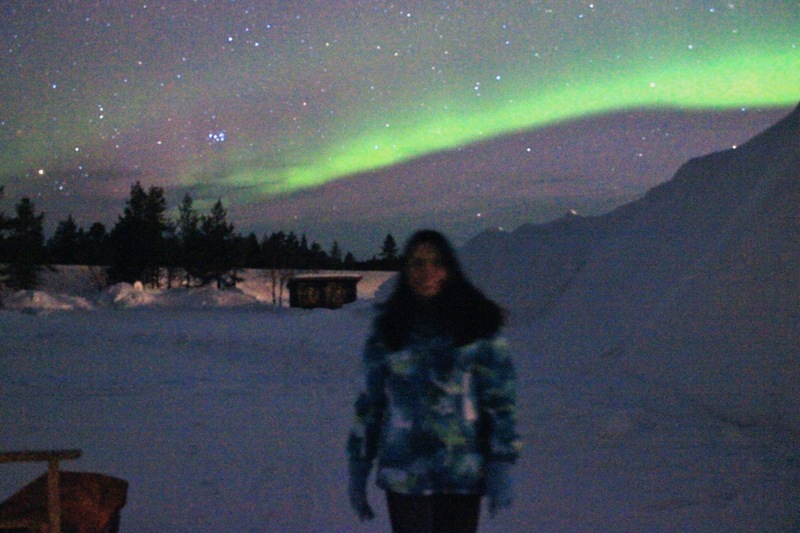 One of the happiest moments of my life… standing in front of the northern lights! Amazing!!! 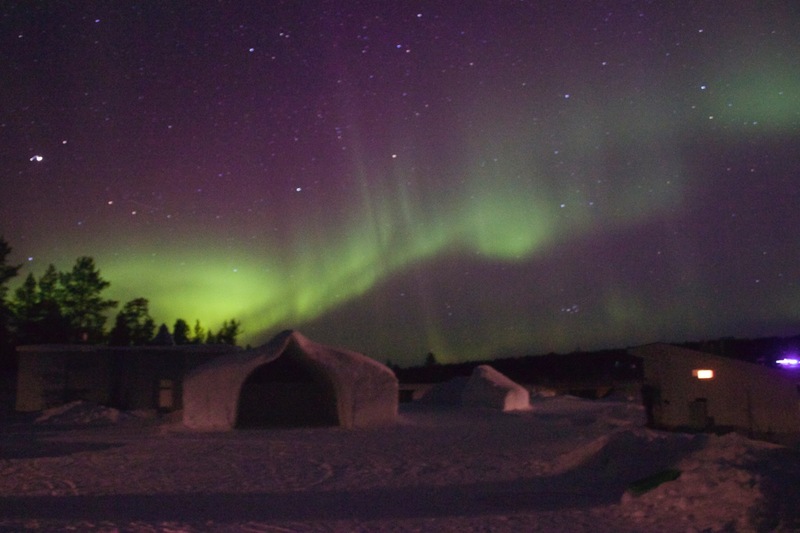 It looks like the northern lights are coming right out of the Snow Chapel! Breathtaking!! This is the only shot with Mia in it before she fell asleep on a sled at midnight all bundled up in blankets! She said she had her best sleep on that sled under the stars! 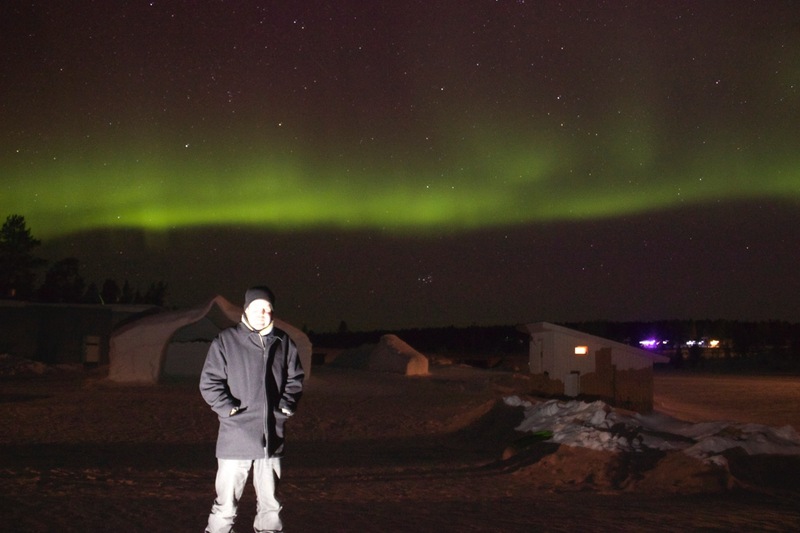 Danny in front of the beautiful northern lights. We worked so hard together trying to get the lights to show up in our shots with us in them. 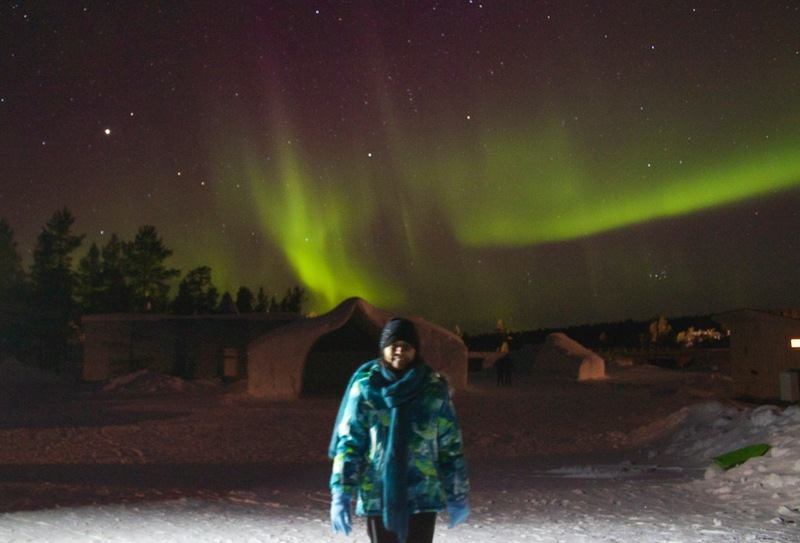 Photographing the auroras was extremely challenging while you are freezing!! This shows one half of the beautiful arch from the northern lights. This is one of my favorite shots from Saturday evening (March 29, 2014)! 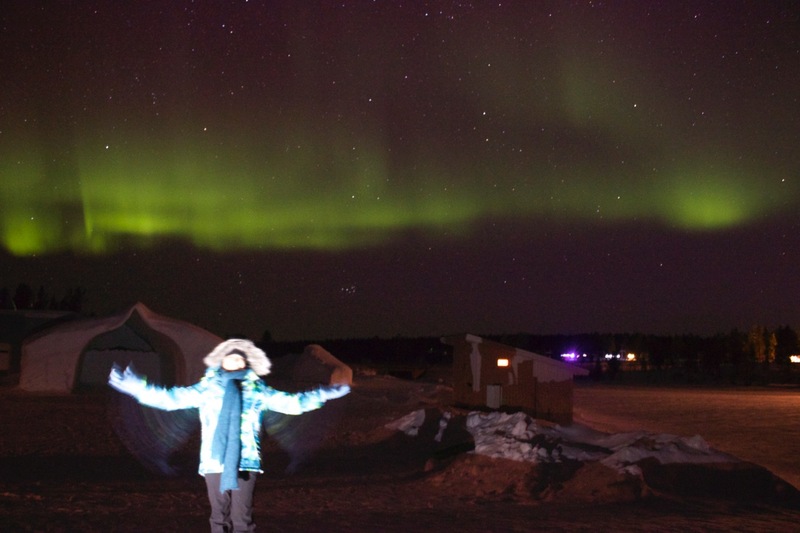 I was so excited to be standing in front of such an amazing show from the northern lights… one of the most exciting moments of my life! 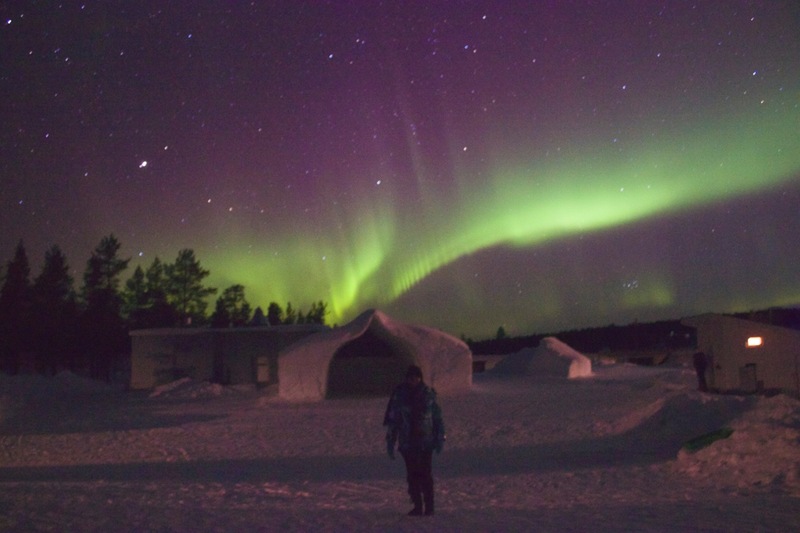 This is a day shot of the area (snow chapel) where we viewed the amazing northern lights! I believe this is the best location at the resort to see them with no trees blocking your view. 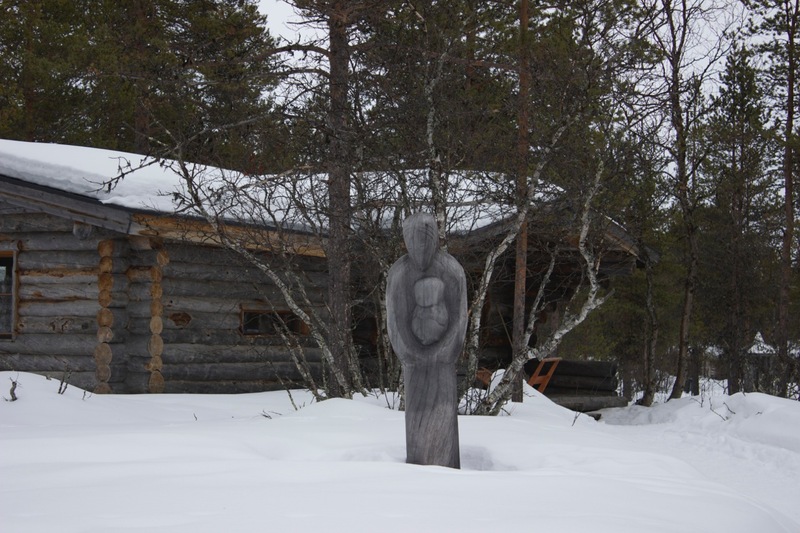 Entrance sign at the Igloo Village Kakslauttanen. There are many beautiful art pieces around the resort. This one was my favorite! Kakslauttanen Arctic Resort in Saariselkä, Finland 99830. Aurora Forecast (Includes the very important Kp tracker while aurora hunting. 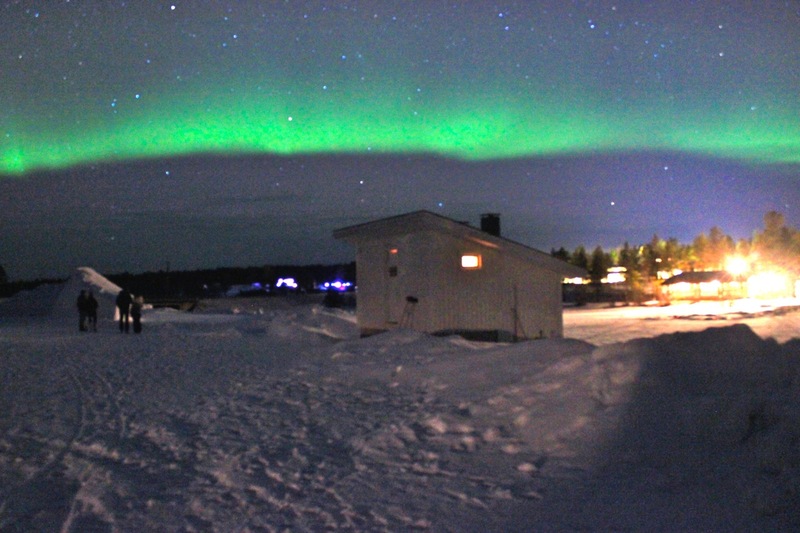 We only needed a Kp2 to see the auroras since we were so far north). 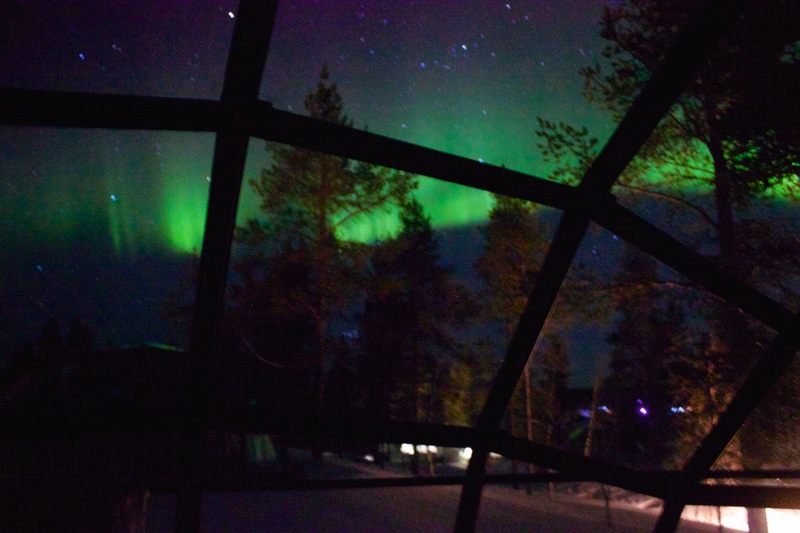 Stay in a glass igloo in Lapland (see an amazing aurora borealis show)!